As October 1st marks the one-year anniversary of the EMV liability shift in the U.S., EMV migration continues to pick up steam, and more merchants and cardholders are getting used to chip cards. However, it has been a significant change in behavior for both of them. Today, merchants typically have to prompt the customer at checkout to insert a credit card into the reader as opposed to swiping it when using the point-of-sale (POS) system. Both cardholders and merchants have raised some concerns that EMV transactions seem to be slower than traditional magstripe transactions. However, the slowness of the EMV transaction is more perception than reality. 1. Consumer perspective: The consumer perception of the speed of an EMV transaction is affected by two factors. 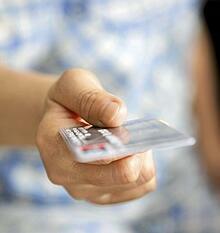 First, using EMV cards is a new experience in the U.S. Consumers are accustomed to swiping magstripe cards. When a consumer swipes a credit card at a payment solution, it can be immediately put it back in a wallet or purse while the transaction is being processed. In the case of an EMV transaction, the consumer inserts the card into a payment solution and leaves it there until it has been completed. Since the consumer can retrieve their cards more quickly with a magstripe transaction, they perceive EMV to be slower. Secondly, many POS devices allow the cardholder to insert a chip card into the payment device once the cashier begins scanning the items and well before the actual transaction takes place. For example, a customer with a full shopping cart at a grocery store may insert a card into the payment device as the cashier begins to scan the items. After the cashier is done scanning the items (which could take a while), the register transmits the total amount due to the chip card reader to process the transaction. This is when the actual EMV transaction begins. From a customer’s standpoint, the interim wait time gets added to the actual transaction time, which only lasts a few seconds. 2. Connection type: There are still many small merchants using dial-up connections to process EMV. These slower connections are remnants of their previous system. The amount of information the payment solution communicates for EMV is much larger than a typical magstripe transaction. The size of this data package increases further if the merchant decides to implement an encryption solution, which is recommended. Dial-up connections can work in these cases, but they were never intended to transfer large data packets. So they slow down the process and create a negative perception that EMV transactions are much slower. To avoid this issue, a broadband connection is best-suited for both speed and reliability of these transactions. 3. POS Application impact: POS applications, running on an electronic cash register (ECR) or merchant host, vary widely in their EMV transaction optimization. These applications don’t have to be optimized in order to be EMV-certified. This optimization takes repeated development cycles, which require time and money. Merchants that have invested the time and money have proven that EMV transaction speed can come close to that of magstripe, but many POS applications are still perceptibly slower. This aspect of speed is not necessarily the fault of the EMV transaction size. This becomes apparent when the same EMV card reader at two different merchants has drastically different transaction times, leading to the conclusion that it’s the POS application that is different. Hopefully, as time goes by, applications will become more efficient by making internal changes that don’t require recertification. In addition to upgrading to a broadband connection and optimizing POS applications, there are some other solutions to help merchants optimize and maximize the speed of EMV transactions. U.S. Card brands have come up with solutions to improve the perception of speed on EMV transactions and help merchants streamline chip card processing. Visa’s Quick Chip, MasterCard’s M/Chip Fast, and other enhancements help provide the “magstripe experience” on EMV transactions. The cardholder is able to insert a card into the payment terminal and remove it in a matter of seconds. This enhancement is available as a software update to the merchant’s payment terminal and POS system. You can find more details and links to these solutions in our blog article on Speeding Up EMV. I hope the present article has been helpful and has helped dispel the myth of the slower EMV transaction. Don’t forget to submit more questions in the comments section or on our Ask an Expert page.